Optimum gloss enhancement and slickness! One gallon of Optimum Instant Detailer & Gloss Enhancer makes 4 gallons of an exceptional quick detailer! Dilute 1 part concentrate to 3 parts water. Pour the mixture into a spray bottle. Mist and wipe to reveal clean, glossy paint instantly! If you’re looking for a quick detailer to maintain your Optimum shine, Optimum Instant Detailer & Gloss Enhancer is the perfect addition to your collection. The gloss and slickness of the paint are restored instantly. Reflections appear deeper and the paint will have amazing wet-looking gloss. Optimum Instant Detailer & Gloss Enhancer removes light dust and dirt to uncover and enhance the paint in just minutes! Optimum Instant Detailer & Gloss Enhancer utilizes flouropolymers, which are strong and durable polymers that also happen to be extraordinarily slippery. Nothing sticks to them. In fact, Teflon® is made with flouropolymers. Flouropolymers give Optimum Instant Detailer & Gloss Enhancer its repellency to dirt, dust, oil, and grime. Regular applications between washes will keep your vehicle looking cleaner and, of course, much slicker! Another benefit of Optimum Instant Detailer & Gloss Enhancer is that it is environmentally friendly both in its ingredients and in the fact that it can reduce the frequency of car washes. Optimum Instant Detailer & Gloss Enhancer can be used as a waterless wash to remove light contamination. 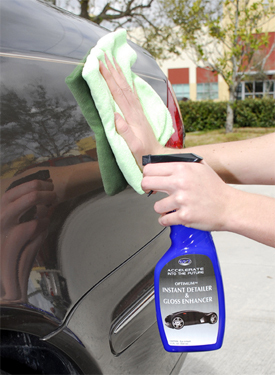 Optimum Instant Detailer & Gloss Enhancer can be used on paint, glass, metal, and plastic! Optimum suggests using the Optimum Instant Detailer & Gloss Enhancer in conjunction with Optimum No Rinse Wash & Shine. Use No Rinse as usual but, before you dry the vehicle, spray on some Optimum Instant Detailer. It will create a super slick, incredibly glossy finish. Optimum Instant Detailer & Gloss Enhancer is also an excellent companion product to Optimum Opti-Seal. Whereas Opti-Seal’s main objective is protection, Optimum Instant Detailer pours on the gloss and slickness. The combination can’t be beat! Wait about 30 minutes after applying Opti-Seal to use Optimum Instant Detailer. Optimum Instant Detailer & Gloss Enhancer is the missing link in your Optimum detailing process! Now you can enhance the gloss, slickness, and protection between details with Optimum’s own Instant Detailer & Gloss Enhancer. Optimum Opti-Seal 8 oz. Free Bonus! This product is incredible & the best of its kind. It works on paint, glass, plastic, and rubber. Does not streak or leave a residue. And it's inexpensive. Should be in every detailer's bag. Been using Wolfgang detail spray which is a good product, however Optimum is cheaper and I do believe better. I have found my new detail spray. I have found over years mix as what they state on anything so property mixed with distilled water, worked well on all surfaces, smells nice, no greasy feel, super sick feel almost like silk. It will be a go too product. I will keep it around, love all their products. This product works beautifully over Opti-coat adding an additional level of shine to the already brilliant shine of Opti-coat. No streaking, has worked great on all exterior surfaces even where some carnauba based detailers have struggled for me. It glosses everything black plastics, paints and glass. I can easly see getting addicted to this stuff!